River Cess County, Liberia – Timber! 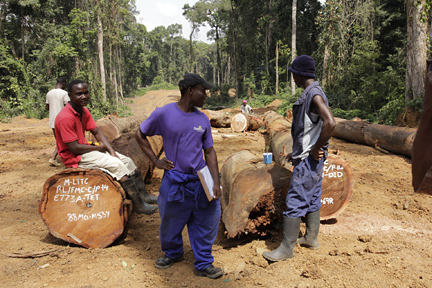 A large valuable tree is felled in a tropical forest in Liberia once logged over for war profit. Soon after Prince Logan, a 34-year old chainsaw operator, deals the final blow to a tall Lovoa tree, creating daylight as the tree crashes through dense neighboring vegetation, Apollo Barcon, a 39-year old felling clerk, scrambles over vines and branches with a clipboard in hand. Barcon’s job is to apply a barcode and record the tree on a tree data form which will help track the log all the way from the stump to the point of export. That tracking system, known as the LiberFor chain of custody system, is seen by experts as one of the few bright spots in a Liberian forest sector that has struggled to repair the damage done by years of mismanagement, corruption and over-exploitation under President and warlord Charles Taylor. Since UN sanctions against Liberia’s export of timber were lifted in 2006, the post-war government of Liberia, supported by the international donor community, has enacted a number of reforms that seek to ensure that forest resources achieve commercial, conservation and community goals and generally benefit the country more effectively. Logan, the chainsaw operator, recalls the days when Oriental Timber Company (OTC) ruled over this swath of forest in River Cess County, in central Liberia. "There was no barcode system, no paint, nothing. We just went in and felled trees along two lines." Branding hammers were sometimes used to mark logs for the payment of royalties. But the system did not provide adequate traceability of either logs or logging revenue, with millions of dollars diverted toward bribes and illegal payments including arms purchases. Today Logan works for a forest concession operating within an improved legal framework. The US government first provided funding for the establishment of a more sophisticated chain of custody system, stipulated by the National Forestry Reform Law of 2006, to manage the forest sector with greater transparency and accountability. The Swiss private company Societe Generale de Surveillance (SGS) was contracted to set up and operate LiberFor with the expectation that the system would be self-financing by the end of 2009 and transferred to the Liberian Forestry Development Authority (FDA). Because the revival of commercial forestry in Liberia was slower than expected, SGS in fact was not able to cover its costs by that date and needed additional time to deploy the chain of custody system in the field. At the request of the Government of Liberia, the international donor community agreed to provide additional financing for LiberFor through two trust funds, the multi-donor Forest Law Enforcement and Governance program (FLEG) and the multi-donor Program on Forests (PROFOR), for an overall total of $1.55 million (all $=USD) to help bridge the financing gap and allow SGS to deploy additional staff and vehicles in the field. Liberia’s Ministry of Finance also agreed to invest $0.5 million to develop a system that has assisted in securing more than $27 million in net tax revenue for the state in 2008-2012. That amount was however well below government projections, against a backdrop of low productivity, weak infrastructure and poorly enforced tax legislation. The story of the chain of custody’s rollout in Liberia includes both successes and challenges that are relevant beyond West Africa, as a number of producer countries prepare to meet consumer markets’ stricter traceability and legality requirements. The United States and Australia have enacted regulation aimed at preventing illegal timber imports. In the European Union (EU), from March 2013, any operator who places timber and timber products on the EU market will need to exercise “due diligence” to verify the legal origin of their wood, or risk being charged with a crime (read more about the EU Timber regulation). This regulation is the fruit of a 10-year process that began with the realization that efforts to sustainably manage forests would have little traction if the governance of forest resources remained mired in corruption and lack of political will, but also if trade failed to differentiate between legal and illegal wood. The EU’s Action Plan on Forest Law Enforcement, Governance and Trade (FLEGT), published in 2003, gave birth to Voluntary Partnership Agreements (VPAs) – bilateral agreements between the EU and producer countries which are committed to ensuring the legality of their timber exports to the EU. As of January 2013, six countries had concluded VPA agreements with the EU: Cameroon, Central African Republic, Ghana, Indonesia, Liberia and Republic of Congo, with a further 21 countries in negotiation or pre-negotiation phases. Since Liberia is a VPA country, the roll out of the chain of custody system there is expected to receive further technical assistance and financial support from the EU and the government of the UK. Back on the forest floor in River Cess County, Liberia, some of the successes and challenges of managing and controlling commercial forestry in a difficult country context come to the fore. First and foremost: jobs. Logan, the chainsaw operator, worked four years for OTC before the sanctions were in place, and has been employed by Liberia Tree and Timber Corporation (LTTC), which operates in a 57,000 ha concession known as Forest Management Contract "C", since 2010. His base salary of $200 a month, supplemented by production bonuses, supports a family of four. He has two children in school and is saving money to open a business. When OTC stopped operating in 2003, he resorted to digging for gold in the forest "because there were no other jobs." Although small-scale gold mining continues to be practiced in the forest, polluting creeks and damaging trees, the work is considered exhausting and unpredictable. Other members of the production crew have similar stories to tell: Barcon, the felling clerk, supports a family of five on $150. He made $100 as a security agent in the port city of Buchanan in the past. Unless you have a degree and can work in an office, you have to take a hard job in the bush, he says. Employment is a priority of many governments and communities, and particularly so in Liberia where the disarming and reintegration of thousands of former soldiers was seen as a lynchpin of the country’s post-war stability. In post-conflict Liberia, informal pitsaw logging was seen as a large source of jobs for ex-combatants and produced wood for rebuilding efforts. Reforms also aimed to revive large-scale commercial operations which had been put on freeze by UN sanctions. (see Forests, Fragility and Conflict, published by PROFOR in 2010). The chain of custody system, along with new bidding rules, sustainable forest management guidelines, social agreements, and social and environmental impact assessments, was part of the improved legal framework conceived to allow logging operations to resume and provide both government revenue and jobs in remote forest areas where opportunities are low. In the meantime, the informal chainsaw logging sector (known as "pitsawing" in Liberia) continues to provide an important source of flexible, fast-paying day jobs for thousands of Liberians. At the Sinko wood field, one of several depots around Monrovia supplied in wood by mobile chainsaw operators, the direct and indirect employment impact of the industry is clear: traders and customers hire haulers and other workers to saw and move planks as needed; women wander the alleys selling food to the market's workers and visitors; and an association that tries to defend the interests of chainsawers and timber dealers nationwide boasts 15,000 members -- without counting all the helpers and haulers involved on an ad hoc basis. For Edward S. Kamara, Manager for Forest Product Marketing and Revenue and point person for the Chain of Custody at Liberia’s Forestry Development Authority (FDA), the sector needs capacity building and investment: introducing artisanal sawmilling and creating cooperatives for small forest enterprises could improve the quality of planks and ultimately generate more jobs and added value. Liberia’s efforts to re-start logging operations for export were challenged by the dilapidated state of road and port infrastructure in the aftermath of the war, which made the transport of logs costly and often impossible. Many roads were impassable in the late 2000s. Seasonal dirt roads were gradually improved, but by 2011, only 456 out of an existing road network of 6,162 miles were paved and many of those roads were in bad condition. Bringing the ports back to normal was also slow. The port of Monrovia and Buchanan were the only two operational ports until August 2012, when the port of Greenville -- the port that is closest to the richest forest concessions in the country’s southeast -- was finally dredged and cleared of shipwrecks. The port of Buchanan returned to operations in 2009 but can only manage only about 25 to 30,000m3 of logs per month. Although the road from Monrovia to Buchanan has been improved, it is not paved all the way. "Once it is easier to go from Monrovia to Buchanan, I expect vessels will prefer to dock here than in the port of Monrovia because goods will access coastal towns more easily, and the Buchanan port is less congested," says Patrick Konneh, Buchanan Port Manager. The chain of custody system relied on state-of-the-art technology – bar codes and robust industrial-grade personal digital assistants (PDA) – that allowed for precise tracking but also created implementation challenges in the context of poor Internet and satellite connections, buggy software, manual errors and physical constraints. SGS relied on technology supplied by UK private company Helveta: PDAs that were too expensive to deploy widely in the field and failed to connect reliably to satellites and servers; barcode tags shipped from Switzerland that were difficult to nail into tropical hardwood; and software that was also too cumbersome. "If there was a typing error, it would take a half day of data entry work to find the mismatch and correct it," recalled Sebastian Schrader, Project Manager for Forestry at SGS Liberia. SGS was forced to create its own parallel software ("LiberTrack") to ensure that traceability and invoicing would keep up with production once logging volumes and the number of small shipments increased dramatically in 2012. On the plus side, the system for tagging trees in forest blocks and verifying compliance along the chain of custody has worked relatively well according to SGS. Logging companies have been trained to tag and map every tree over a certain diameter in 50m2 cells and 1km2 forest blocks identified in their forest management plans. The plastic barcodes, which initially listed 12 digits, were redesigned to show only 8 digits (lowering the probability of errors) and allow room for nails. The barcodes still have a tendency to fall off when logs are skidded (dragged by bulldozers) out of the forest, so LTTC uses a parallel paper numbering system at that stage. The fact that private companies have devoted manpower to comply with the system is a success in itself. According to Kwabo, it costs the Mandra forestry group about $210,000 per year to implement the chain of custody. This includes $60,000 for a staff of 30 persons and $150,000 for other CoC requirements including the cost of block mapping, inventory surveying and enumeration, tagging and equipment. Thomas de Franqueville, who worked with SGS in Liberia between 2009 and 2011, remembers feeling frustrated at first that the training he provided in the field was not translating into tree inventories. "That all changed," he said, "when a buyer asked for logs that carry the SGS barcode. From that day on, the logging companies complied with the system." Trade offered a concrete incentive to comply with the system and adopt its technology – no matter how complex and costly. For SGS’ Ivan Muir the lesson here is that technology should not be tied to a subcontracted provider, so that fixes can be done in real time and take advantage of the latest advances. "Think about how much your cellphone has changed in the last five years," he said. A more nimble system would also have been easier to transfer. The chain of custody system is credited with making the export of illegal logs from Liberia much less likely than in the past. SGS verifies 5% of the tree data at felling, 30% at crosscutting and 100% at the point of export. Vessels are allowed to leave with the timber onboard only when stumpage fees and export taxes have been appropriately paid. (Wood export by land to neighboring countries is not thought to be significant at this time.) The system currently applies to all exports, no matter the destination: although China, the biggest market for Liberian wood, does not have traceability or legality requirements, it is sold wood with LiberFor barcodes. No system is totally tamper proof. Logging companies could still theoretically bypass the system by not declaring logs, getting them quickly to a sawmill and into the domestic market – or selling them directly from the forest floor. "There is always scope for cheating. The idea is to make it difficult and not very worthwhile," said Sebastian Schrader, SGS. However, governance concerns plaguing Liberia’s overall forest sector have cast a pall on the system. The chain of custody system operated by SGS was meant to verify the legal origin of timber and that export fees and stumpage taxes were paid. It was not designed to ensure the overall legal compliance of logging operations. This resulted in a paradoxical situation in which SGS, as a subcontractor of FDA, provided training, barcodes and export permits to logging companies operating through Private Use Permits (see box below) issued in many cases illegally. It took action from the President’s office and through the court system to halt the abuse of Private Use Permits (PUP) at the end of 2012. The head of the FDA was suspended, a moratorium was imposed on PUP operations, but any tree felled before October 22, 2012 (when the PUP moratorium was upheld in court) was given the green light for export. Private Use Permits (PUPs) were envisaged in the 2006 National Forestry Reform Law to allow private landowners (individuals or groups of individuals) to exploit timber resources on their private forested land by contracting with logging companies with the approval of the Government. But lack of supporting regulations created a loophole that was exploited and subverted in late 2010-2011, when 2.3 million hectares of land were allocated by the FDA as an alternative to more onerous Forest Management Contracts (FMC) and Timber Sales Contracts (TSC) concession types, sometimes on the basis of forged deeds. This resulted in a surge of timber exports. Exports from PUPs accounted for 53% of total exports in 2012. At the port of Buchanan, and in the offices of SGS in Monrovia, logs felled by Forest Venture and Atlantic Resources for example, were still being processed in December 2012 according to the rules of the chain of custody although the underlying deeds for some of these companies' permits were of questionable legality. Overall, some 65% of the exported timber certified by LiberFor in 2012 came from forest permits that are currently being challenged as to their legality (PUPs and timber from University of Liberia forest). Nor does the chain of custody ensure compliance with sustainable forest management plans. The system has been successful in enforcing the idea that only logs over a certain diameter-at-breast height can be felled and exported. Because the stock and felling data is mapped to forest blocks, the system also encourages companies to stick to their logging rotation plan. But respecting an annual coupe is only one part of sustainable forest management. The enforcement of social agreements between companies and communities affected by the forest concession is another area that falls outside the purview of the chain of custody. Observers point to the culture and limited capacity of the FDA as the weakest link in the system. The PUP scandal was seen as a symptom of the regulatory agency’s incapacity and unwillingness to tackle the forest sector in a comprehensive manner. The fact that commercial forest enterprises were allowed to export although they were in massive arrears in terms of their land rental and bidding premium payments, points to weak overall governance as well. Limited resources have also hampered FDA’s effectiveness. "The FDA doesn’t have the logistics to monitor beyond what a company shows them," said Kamara, of FDA. "It’s difficult enough getting staff from Monrovia to the field.” Kullah Jackson, member of the National Benefit Sharing Trust Board, concurred: If agents are "forced to rely on [logging] companies to fuel their motorbikes, or even sleep in the logging compounds, they can easily be bought over. How do you expect them to enforce the law to the letter?" Some of the oversight functions which FDA cannot adequately perform could arguably be delegated to communities and civil society. The fact that SGS was not able to create a functioning website to publish forest production and export data, as originally requested , is a weakness in this respect. "The data is not transparent enough," said an observer familiar with the forestry sector. "Communities are expecting payments related to the volume cut by logging companies. But nobody knows how much is being harvested." Although SGS shares its data freely with various stakeholders, strengthening access to the information for a wider audience would ensure greater transparency in revenue collection and benefit sharing. "Forest management is no longer a matter only for FDA. It’s a national issue," said Kamara. "Local communities have to be involved and the international community has to stay involved, particularly at the implementation stage." The chain of custody system was meant to be built, operated and gradually transferred by SGS as logging companies, the FDA, the Ministry of Finance and other agencies acquired the capacity to operate the system. The system however was launched just as the market for high-end tropical wood was hit by a global recession. "Timber prices and Chinese imports crashed in 2008-2009 which is exactly when our business was launched," said Ivan Muir, Managing Director, SGS Liberia. Complying with the improved legal framework (from bidding to conducting social and environmental assessments and working with communities) also took time. As USAID support ended in 2010, funding from FLEG and PROFOR helped to fill an important financial gap that allowed for capital expansion. LiberFor was able to create its own office space in Monrovia, open field offices in Buchanan, Greenville and Zwedru (where SGS and FDA staff now coordinate and share field activities), and purchase additional cars. "It allowed us to deal with the needs on the ground. The basics are now in place. So the current budget only needs to cover operating costs," said Muir. "What turned the tables was the PUPs," said Muir. "You need a minimum of timber export for it to be viable as an independent activity." In 2011, the FDA issued 48 PUPs, covering 2.2 million hectares of forests – an alarming 40 percent of Liberia’s total forest cover, raising significant concerns. Now that most PUP operations have been halted, Muir’s hope is that investors will turn to the larger FMC concessions they also own to put their machinery to use. SGS points out that legal concessions (FMCs and TSCs) are potentially able to yield 500,000 to 700,000m3/ year on a sustainable basis, which is more than twice the total volume exported in 2012. "What the system needs is more legal volume, not more illegal timber." said Schrader. For Alfred Brownell, one of the authors of the 2006 Forestry Law and the President of Green Advocates, an environmental NGO , the system is simply too expensive to be supported through legal commercial forestry operations. "If your business model depends on PUPs for sustainability, you’re investing in conflict and instability." Brownell suggests moving toward community-based monitoring of the forest sector to create a more nimble system that would be less tied to production levels and unsustainable land uses. This would require large investments in capacity building and would not easily match the robustness of LiberFor. The future demand for verified wood is also unknown, casting some doubt on the long-term viability of the system: Although the United States, Australia and EU want legal, traceable timber, 88% of Liberia's export timber in 2012 went to China and India, countries that have no consumer markets with such requirements. SGS’s five-year contract for the establishment and transfer of a chain of custody system came to an end in December 2012. The UK Department for International Development and the European Union, together with the Liberian Government, are currently selecting a service provider to take over LiberFor’s functions and extend these to meet the requirements of Liberia’s FLEGT Voluntary Partnership Agreement. Liberia, like other VPA countries, has also committed to applying the future legality verification system to the domestic timber market. The service provider will establish and operate a new department within the FDA charged with verifying timber operators’ legal compliance and tracking timber harvested from forest to port. The service is expected to start around April 2013 and after 5 years operation will be handed over to the Liberian Government. Although Liberia had yet to ratify its VPA agreement as of February 2013, experts expect the chain of custody system to evolve into a legality verification system, addressing a much broader set of legality issues. This story was reported in December 2012 by Flore de Preneuf, PROFOR's Communications Officer.The views expressed in this story do not necessarily represent the views of PROFOR's donors, the World Bank, or other institutions involved.